The forecast for the day was not good, with heavy rain predicted from about 10.00 am onwards but that didn't stop the Ladies v Men competition going ahead with its usual enthusiasm and banter. The rain did come and most 4balls made a decision to end their matches early. 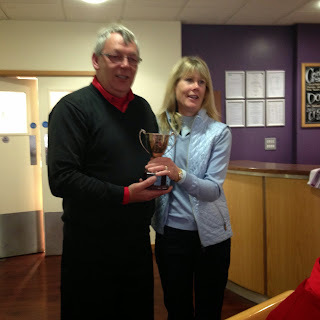 Unfortunately, the result was a repeat of last year with the men lifting the Cup for the second year running with a 4:2 victory over the Ladies. We finished the day with sandwiches and chips, where on behalf of the Ladies, I presented Phil Chester with the cup. Well done to the Men's team for their victory. We will have another go next year! Thank you to all the Ladies who turned out in the rain to take part in today's competition.